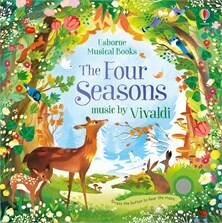 Listen to special arrangements of Vivaldi’s Four Seasons concerti for violin while exploring the changing seasons in this stunning book. Each beautifully illustrated scene shows a different season with fingertrails to explore and a button to press to listen to the music. A delightful way for children to discover Vivaldi’s much loved music.